It is no secret that I love nail polish. I enjoy doing my nails, it feels like taking a break just for me. I’ve even made my own DIY cuticle oil and a tutorial on how to do a Hectic Mommy Manicure. So, a friend told me about this concept. Much like the onsie bouquets and other flower type gifts, this craft holds little jewels in the center of each flower. Beautiful lacquer jewels. This nail polish bouquet is the perfect gift for any woman who likes to take care of herself. You could easily change the “sophistication” level by using more adult colors, or by peppering in some real flowers. I plan on bringing it to a white elephant auction this Christmas. The first step is to gather a few polishes. I removed the color stickers from the bottom, because they were ugly. I kept them though, and you should too. Some of us nail polish fanatics might NEED to know the official colors. 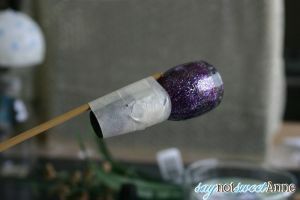 Use the masking tape to secure the polish upside down to the stick. Masking tape is important, because you don’t want the recipient to have to struggle to get the polish out, or to leave a sticky residue on the bottle. 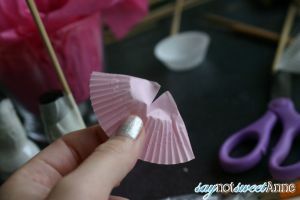 Cut an x shape in the center of your cupcake liner. Or, you can use tissue paper squares cut to different sizes. 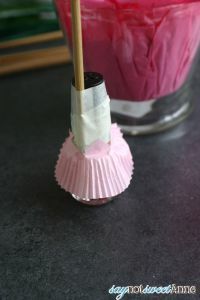 Slide the paper up over the stem to the polish and secure with more tape. These will act as your flower petals. Experiment with different sizes and colors. Scrunch them a bit to help them separate and look more natural. 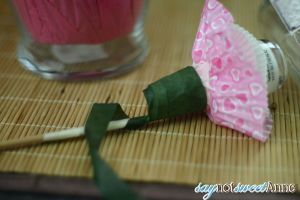 Once the flower is made, wrap the stem in green floral tape, so everything looks uniform. Set your completed stems aside. Prep your vase by fitting a strong piece of floral foam in the bottom. Since my vase is clear, I put a layer of tissue paper between the foam and vase, to hide it’s ugly color. 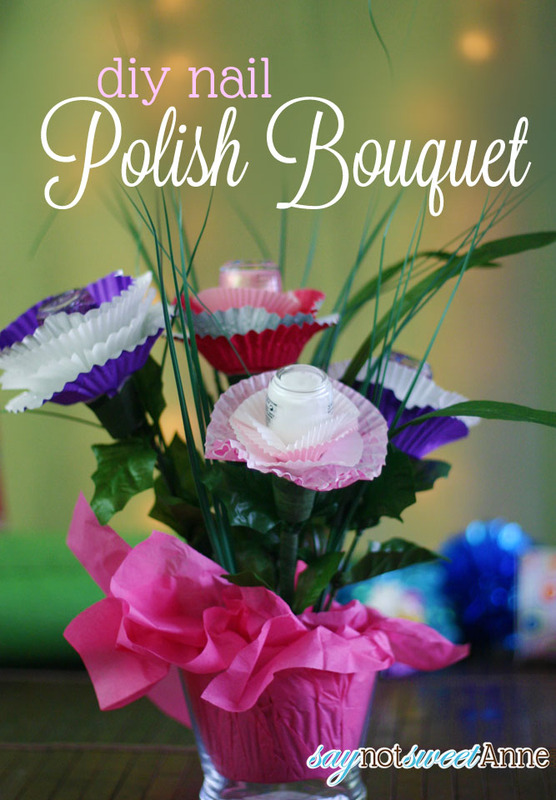 Arrange your polish flowers and your fake greens in the foam. Try to vary the height a bit. You could make it as full or as sparse as you like. That’s it! I really love the flexibility and the wow factor of this gift. you could easly spend $50 on polish and have it bursting with flowers. Or, you could choose 3-4 polishes for much less and still have a beautiful gift! I want to make one for my teenage daughter she loves nailpolish and flowers! Thanks for the fun n cute idea! You’re so creative Karla! I will do the same. I’ve got lots of nail polish here!